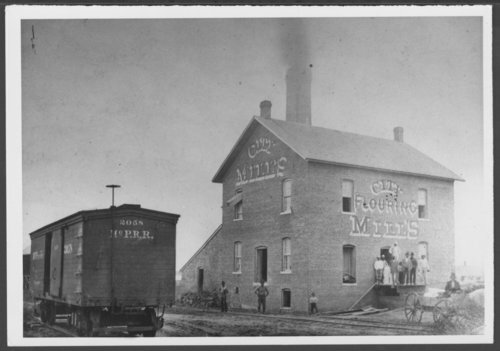 This black and white photograph shows a group of men standing on the loading dock in front of the City Flouring Mill in Hutchinson, Kansas. Standing off to the side are two men, a young boy, and a gentleman seated in a wagon. In the foreground, boxcar #2058 from the Missouri Pacific Railroad is visible.